Our Pro Tools course provides in-depth training for recording and producing music in the engineers choice, and recording & mixing studio standard DAW. It doesn’t matter what genre the music you work with is, if you want to use Pro Tools to create your tracks, this course will cover the music production and engineering skills you need. 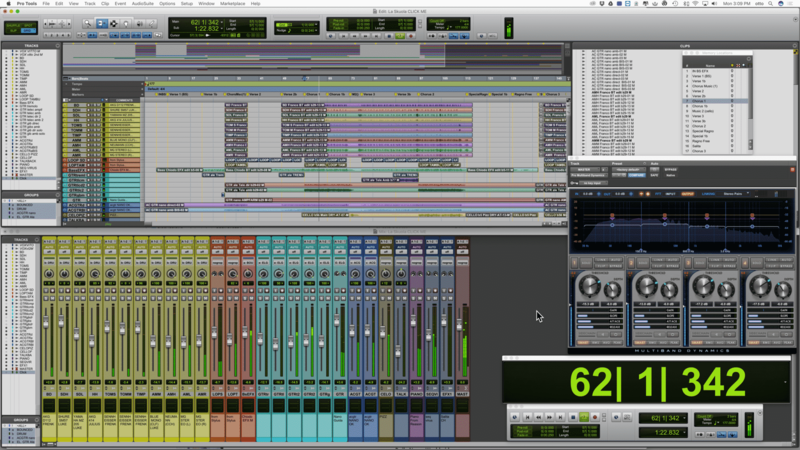 Even if you are a more experienced Pro Tools user you will benefit from this course, as all of the elements will be covered in detail, peppered with loads of practical real-world tips – giving you the edge over anyone learning any other way. Total class time is 36 hours where you can ask a question and bounce off of your instructor and fellow learners exactly when you’re feeling inspired, or …confused! This is why some say that there is no substitute for music production courses in person. On successful completion of the course, you will receive an industry-recognized certificate. Many learners these days prefer to use their own laptops on our courses for things like getting help customizing their set-up, and they have their project exactly as they left it in class to work on at home. So we made the course more affordable, but added a $75 supplement for learners who wish to hire an iMac loaded with software. Please ensure you book an iMac when you book your course if you need one. Controller keyboards, and headphones are provided for everyone. Instructor is very knowledgeable of the ins/outs of the DAW. Our class was very small which allowed for individual instruction and guidance as well. Concluding the course, I feel way more comfortable maneuvering through the DAW and applying other concepts using the system. It was a pleasure and honor learning from such talented and real people. People that are actually out there themselves practicing what they preach! As a songwriter/producer I relied heavily on engineers for recording and mixing if I wanted to get my tracks sounding like masters. I always wanted to do more myself but struggled to learn anything watching an engineer zip around at 1000 mph! Then I found Garnish and did their course. It was exactly what I needed, we covered everything I was unsure of in the past from using buses properly, EQ, audio compression and using specialist mastering plugins. Everything was explained and demonstrated in a way I understood. I never thought I'd ever be able get such great sounding tracks doing everything myself. Fantastic facilities and expert tuition from top class engineers/producers! Will defo be back for the Mixing and mastering Course. I wasn't sure I would learn much from this course, having spent a lot of time reading about production, mixing and mastering, but the insight of experienced professionals (who are also great instructors) filled in countless gaps for me - making it plain I have to re-visit lots of my work which I thought I'd made the most of, but hadn't. Wide spectrum of knowledge and expertise in modern music trick-nology. Industry recognized instructors that talk the talk and can walk the walk. Don't think twice book a course with the GMP!